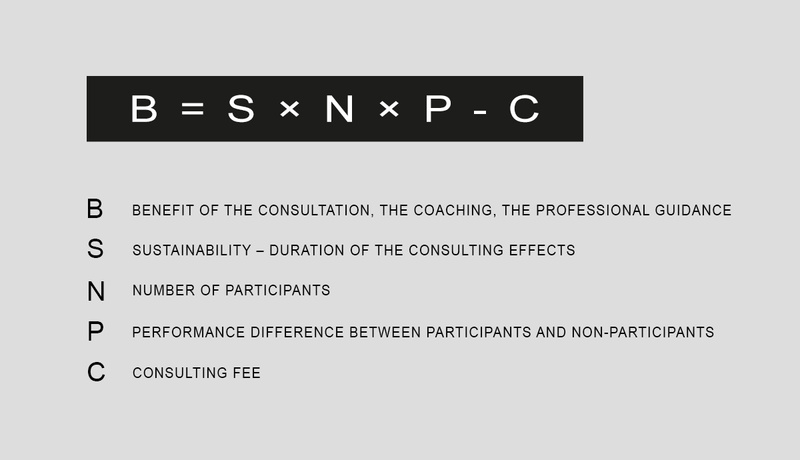 Developed by Prof. Dr. Heidi Möller (University of Kassel, Institute for Psychology, Chair for Theory and Methodology in Consultancy), the aforementioned formula serves as a tongue-in-cheek orientation for the calculation of remuneration. After a preliminary meeting about your needs and objectives, we will jointly agree on the costs and the benefits. That is the basis which will help us to negotiate remuneration. Please don’t hesitate to contact me: mh@marchusten.com and/or +49 171 365 0479.